How do I make kombucha tea? Let us start with the basics first and then we will teach you how to make kombucha tea and what are kombucha health benefits. It is found nearly about 2000 years ago, and it is a fermented tea. Some people misunderstand that kombucha is a mushroom. But no, It is a fermented tea which is made from bacteria and yeast mixed with black or green tea with sugar. There are many flavors available in the supermarket if you do not want the green tea or the black tea flavor. Scoby is a mushroom which is used to make kombucha tea because Scoby will act as an ingredient which will help in forming bacteria and yeast in the tea. There are many places where you can buy the tea or just simply order online. If you want to make one at home we will in this article below help you understand how to make kombucha tea. 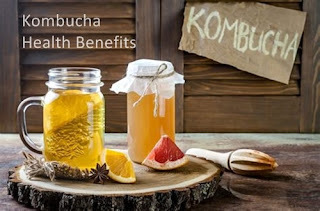 There are many health benefits of the tea, do scroll down to know kombucha health benefits. What is Scoby Mushroom Used in Kombucha Tea? Symbiotic Culture of Bacteria and Yeast is known as Scoby And A Scoby is the living home for the bacteria and yeast. When you add the Scoby to the tea it transforms the taste into tangy and fizzy drink know as kombucha tea. You can also say Scoby is an ingredient used to make kombucha tea. The mixture of normal tea and Scoby is known as kombucha. How Much Kombucha is Safe to Drink Daily? Before you go and buy the kombucha tea or make kombucha tea yourself keep in mind that do not drink too much of it and avoid the alcoholic version. If you remember the chem class in school, do not forget that alcohol is made up by fermentation and the same process is used to make kombucha. So be aware when you buy it from the supermarket as some flavors are allowed to be more fermented and give you a kick in the head as it can contain alcohol as it is in a beer. Having too much kombucha is not safe to drink as it might cause issues like heartburn and various immune system problems. You can drink about four ounces of commercially available Drink and it is safe and can be really effective. Can I Drink Kombucha When I Am Pregnant? A BIG NO, you should not drink the beverage when you are pregnant. As the drink is made up with bacteria there is always a risk of contamination when you are pregnant and can make you sick. Having the drink can result in toxic reactions and can be harmful to a fetus. How to Make Kombucha Tea. Here we will teach you how to make kombucha tea at home all you will need for making the tea is, Scoby mushroom, sugar, tea bags, water, jar with a cloth. 1. Wash Your Hands With Hot Water to Make Kombucha Tea. Washing hand properly is very important as you are going to make a beverage which is a bacterial drink. Do not use antibacterial soaps and handwash, only wash your hand properly with hot water. Because using antibacterial soap can contaminate the Scoby mushroom and destroy the good bacteria provided by Scoby mushroom. You can use apple cider vinegar to wash your hands. It is recommended to use non-latex gloves especially when you touching Scoby mushroom to add in the making process. 2. Steps to Make Kombucha Tea. Take a pot and fill 3 liters of water and put the stove to high. Boil the water for at least 5 mins. Now add 5 tea bags to the hot water and remove the tea bag after brewing. Now turn off the heating and add 1 cup of sugar. Sugar is a necessary party of fermentation as the Scoby mushroom will feed on sugar. Heating should be off while this process is being done as sugar will start to caramelize if water continues to boil and then it is of no use. So that is the reason you turn off the heat. Now take the pot from stove and keep aside to let it get cool under normal room temperature. When the teapot is getting cool down, take a jar and wash it with hot water and do not use antibacterial washing material. Use only hot water. After the tea gets cool pour the tea in the jar and add the starter tea. Now take the Scoby mushroom which you have bought from the supermarket. Take it gently and put the Scoby mushroom into tea jar. After putting cover the top of the jar with a cloth and pack it tightly with a rubber band. Now its time to keep the jar in a warm and dark place where there is less possibility of it to be shaken. This is the process of bacterial growth. The best temperature for the bacterial reaction is from 25 to 30 degree. Here you have to wait for a week to get the reaction complete, do not open the jar to peep inside that what is going on. You will see it from outside that the Scoby mushroom has sunk to the middle or still is floating above the tea. If the mushroom is floating above the tea it is the best. If it sinks in the middle it is of low quality or has been contaminated by Aspergillus. After a week of the process if the kombucha tea is tasting sweet then it is not properly made or it needs more time for the reaction of bacteria. The time is perfect and it is brewed when the PH of tea is 3. You can check the Ph after one week and if it is 3 it is perfect. 3. Finishing the Make Kombucha Tea Process. After a week when you take the jar, open the cloth and remove the Scoby mushroom and also the stuck parts which are there inside. Remove the mushroom and parts in a clean bowl. Now you have to use a funnel to pour the kombucha tea which is still inside the jar and store it in a bottle. Fill the bottle to the top to make the drink fizzy. There should be no gap in between, if there is a gap and the bottle is big, I recommend you to take small bottles and fill to the top to make the tea fizzy. It is important as fizz will only be created when the storage bottles are filled to the top. If it is not filled the fizz will be above the tea in an empty space and will not pump inside the tea. Now when you are done filling the bottles, store it in the refrigerator and it is ready to drink. The tea is enjoyed when served cold. Now after you know what kombucha is and what is the process to make the tea. Here we will explain you kombucha health benefits. As the tea contains good bacteria and enzymes it is known as the natural detoxification drink. There is a particular acid found named gluconic acid which helps the body to remove the toxins present. There is also systemic research carried over this and it is with evidence. Gluconic acid is also known to be good for the liver detoxification. 2. Kombucha Helps in Improving Digestion. Due to the presence of a combination of enzymes and organic acids and also the probiotics, it promotes healthy digestion and soothes an upset stomach. It will also give you relief from diarrhea and constipation. There is a presence of good bacteria in our gut but sometimes these good bacteria are being destroyed by stress, alcohol and other harmful habits. By drinking kombucha you will regain those good bacteria in the gut and hence it helps in improving all gut problems. 3. Kombucha Improves Immune System. Our natural defense system gets more strong when you consume the good bacteria. Due to kombucha tea being made from the fermentation process it acts as probiotics and can prevent you from many kinds of illnesses. When the good bacteria are destroyed the bad bacteria will take over your system and will cause diabetes, cancer, ulcers etc. So you need to kill the bad bacteria. It is a simple logic to understand and improve the immune system. As we have mentioned earlier about the glucosamine present in the drink. This glucosamine is the main ingredient which enhances the hyaluronic acid production in the body. This acid may help in reducing arthritic pain. Nowadays cancer is the no one cause of death in the world. There is a rapid uncontrolled cell growth when someone has cancer. There has been a study on kombucha cancer treatment. And it says that kombucha is helpful and have prevented the growth and spread of cancerous cells as it contains a high level of antioxidants and polyphenols. It is also said that these polyphenols not only stops the cancer cell growths but in some studies it has shown that the cancer cell is being killed by these polyphenols. Tea drinkers are always less likely to develop cancer. There are also further studies made on the kombucha cancer cure. Research shows that it helps in maintaining healthy cholesterol levels and maintains the blood sugar levels. In animal studies, it was found that the tea was able to reduce the levels of bad cholesterol and increases the good cholesterols levels. It is very important that you add kombucha tea in your daily diet as it contains good bacteria and has several kombucha health benefits. 7. Kombucha Health Benefits Includes Energy Boosting. The tea contains vitamin B and iron in it, The iron will increase the hemoglobin levels in blood and hence the flow of oxygen increases. There are many brands who make the tea and are focused on promoting the product stating it as an energy booster. Many brands promote the product stating there are many kombucha health benefits. There is no high level of caffeine in it but some brands might add a little amount of caffeine to it for an extra energy boost. 8. Kombucha Helps Weight Loss. The natural acids and the antioxidant levels which are present in the tea may promote fat loss. Flavors like apple cider vinegar will increase the kombucha health benefits and also the metabolism rate when consumed before meals. The most effective flavor of kombucha which helps weight loss is the green tea flavor. There are many athletes who drink the beverage to boost their performance levels during training or exercise. The tea also is being used to reduce the soreness which is caused by lactic acid which is present in the muscles. This drink is the natural high-performance drink which everyone can intake. The most important vitamins which play role in improving the mood is the vitamin B present in kombucha. The vitamin B1, B6, and B12 provide great kombucha health benefits which help in depression, improving mood and increasing your concentration. Vitamine C is also present in the drink which plays a role of releasing stress hormone and reduces stress. There is also an alcoholic version available in the market which helps in immediate stress relief and will give you a positive feeling. 11. Rich Source of Probiotics. It is said that the drink first originated in Japan or China. As the people in that country knew about many kombucha health benefits. People also say this tea as the mushroom tea in some parts of the world. As this tea is made up of Scoby mushroom which is a home for all good bacteria. There are many probiotic bacteria produced during the fermentation process. A probiotic drink is very healthy for your gut and can reduce inflammation and solve gut problems. 12. Kombucha and Heart Disease. There are many people suffering from heart disease and it is worlds leading cause of death. Kombucha tea can be said as similar to the green tea. It is said that green tea drinkers have 30% fewer chances of developing heart diseases. This green tea heart disease case might apply the same to kombucha tea.